“Did you see any kitties in the backyard?” my mother-in-law asked my son. “No, they were hiding in the avocado tree,” he said. They were. Only it wasn’t an avocado tree. This was a backyard in Oregon. 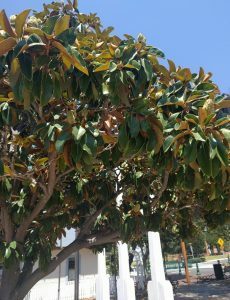 But the leaves of the tree were similar to those of an avocado. See them in the photo above? Plus, my son is two years old. We’ll give him a break. Over time, after years of slowing down and taking close looks at the leaves of the plants growing in our gardens (for bugs, diseases, or fun), we begin to recognize them as surely as the faces of family. I now recognize the subtle differences between the leaves below, and even if you don’t also grow all of these particular plants in your yard I’d guess that you’ll still be able to distinguish them from their look-alikes. 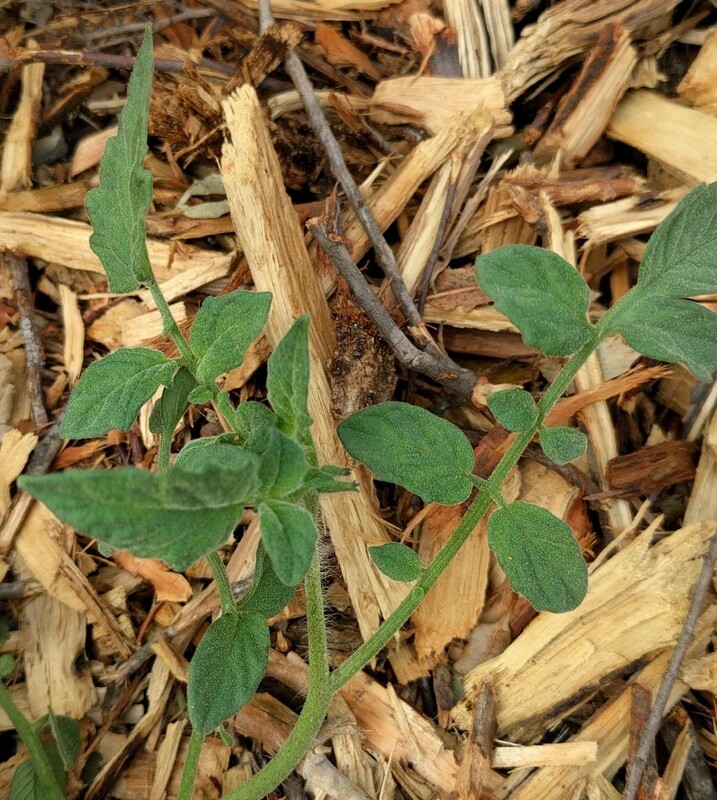 Can you tell which of these photos shows tomato leaves and which shows potato? Their leaves are similar just as many other things about tomatoes and potatoes are similar, or even the same. Taxonomists classify them in the same genus, Solanum. Both tomatoes and potatoes were originally cultivated by people in the Americas and introduced to Europe and the rest of the world by Spanish explorers. Anyway, the photos above were taken in my yard, and so I know that the first one is a potato and the second a tomato. One way you could tell just be looking at the photos is that tomato leaves generally have pointier tips. 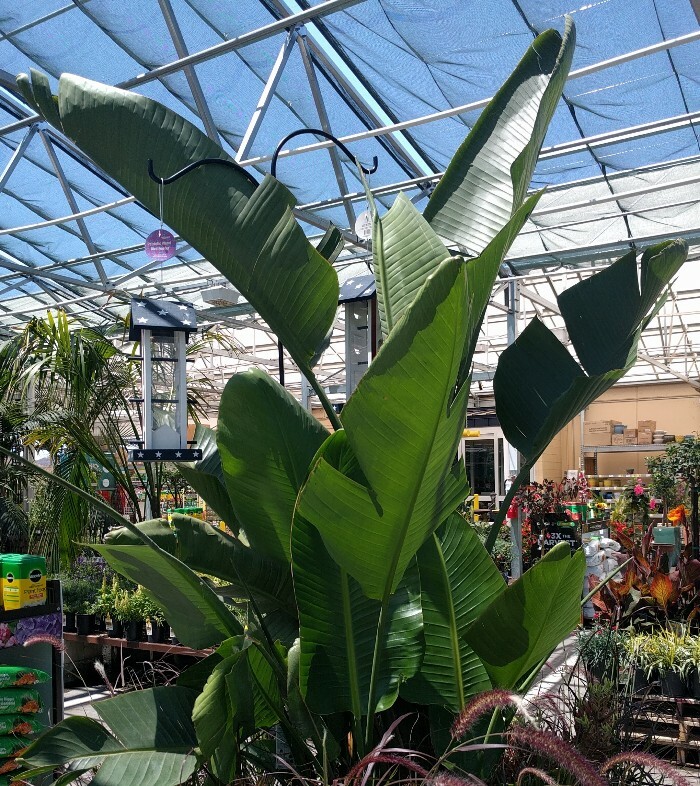 Banana or bird of paradise? The tell between these two is in how the leaves fold: Are they up like a taco or down like a tent? Birds of paradise have taco leaves; bananas have tent leaves. The most obvious distinguishing characteristic for me is the corrugation. Raspberry leaves remind me of accordions whereas blackberry leaves are comparatively flat. This bottom photo, then, is of a blackberry — and the top, a raspberry. Now here’s a fun bonus. Blackberry or raspberry? Why, it’s a combination! 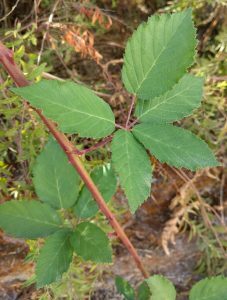 These are leaves on my boysenberry bush, boysenberries being a cross between raspberries and blackberries. Rudolph Boysen invented them, and then Walter Knott (of Knott’s Berry Farm) sold them and made them famous, all of this happening from the 1920s onward right here in Orange County. In nearby Los Angeles County, my grandmother made us boysenberry pies every summer of my youth. To this day, a better dessert is unknown to me than Grandma’s fresh boysenberry pie plated beside Grandpa’s homemade vanilla ice cream. Anyway, some years back I found two feral boysenberry canes surviving in an abandoned corner of their horse corral. 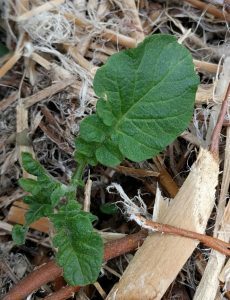 I transplanted them to my yard in San Diego County, and they’ve grown well to make the leaves you see in the photo above, and I have yet to find a variety of raspberry or blackberry that performs better in Southern California than these heirloom boysenberries. Yes, it’s magnolia. I imagine that one was easy. 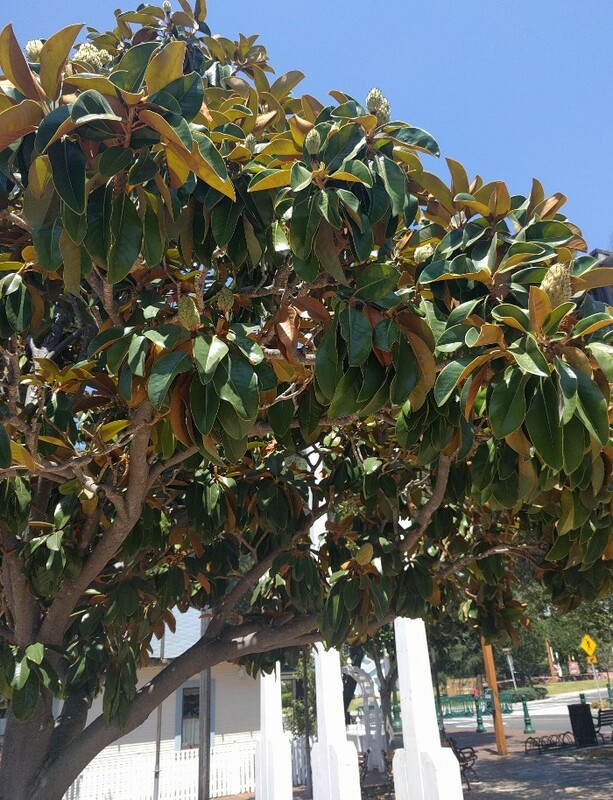 You can see the brown undersides of the leaves, and you can even see the magnolia cones (fruit) that look nothing like avocados. But here’s a challenge. 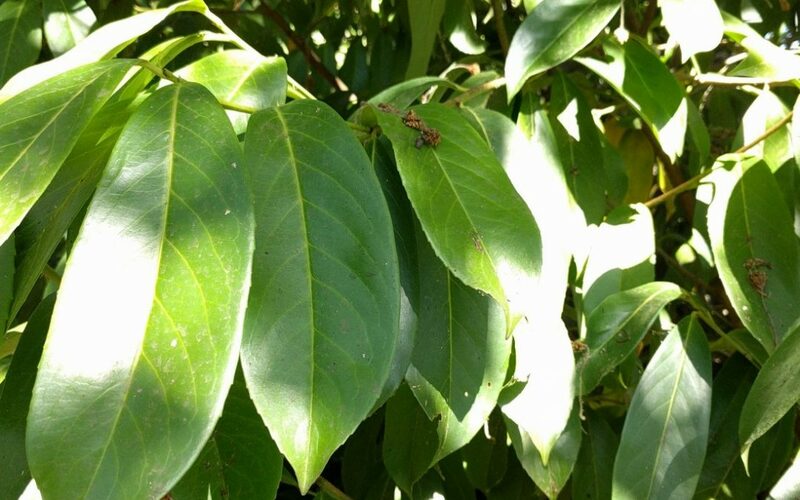 One of the photos below is a Hass avocado stem and leaves while the other is Fuerte. The difference is not so much in the leaves as in the red flecks on the stem. Do you see those in the bottom picture? Hass doesn’t have them, but Fuerte (and some other avocado varieties) does. So that bottom photo is Fuerte. If you have one of these trees, go check the stems on a flush of new growth for red flecks. Finally, can you tell the difference between peach and nectarine leaves? I bow down to you if you can. I would have no idea if this photo showed peach or nectarine leaves if I hadn’t taken it myself. As far as I’m aware, peaches and nectarines are indistinguishable in every way except for the fuzz on their fruit. 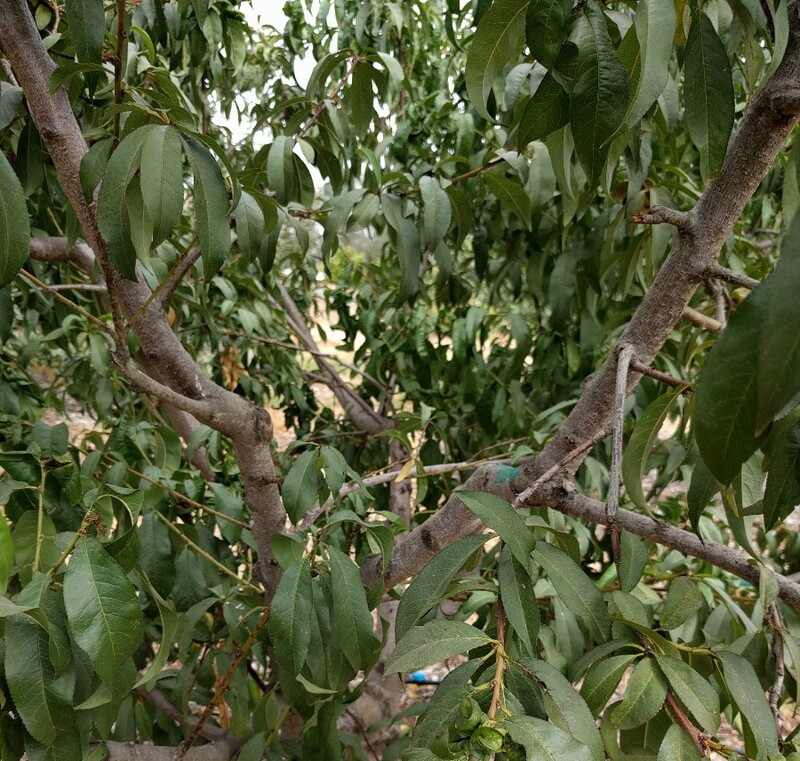 That is, a nectarine tree is just a peach tree without fuzz on its fruit. 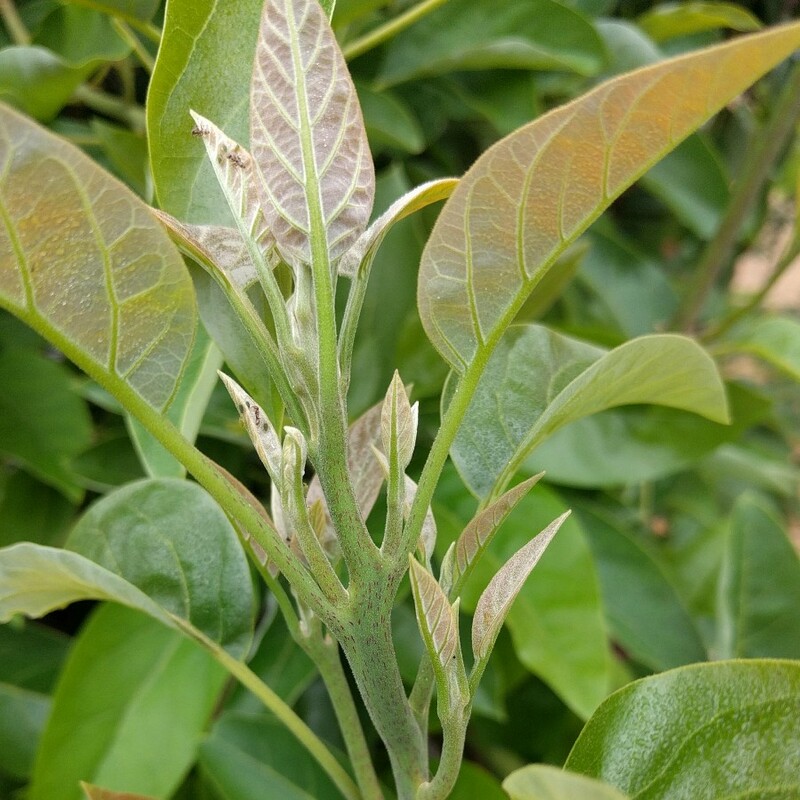 The truth is that the photo shows both peach and nectarine leaves. I grafted some peach branches onto a tree that was originally just nectarine. You can see where I grafted one of the peach branches because I painted the graft union with a blue swatch (center lower right). 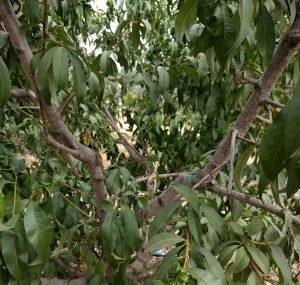 Otherwise, I’d lose track of which branches were peach and which were nectarine because the foliage is identical to my eyes. But maybe I need to pay closer attention? I have always thought that the nectarine has longer slightly narrower leaves. Aaah, interesting. I’ll have to try and notice that. My raspberries have all died and my blackberries have a mind of their own but generally don’t produce much. I have a boysenberry but it might be too shaded so I’ve only ever gotten one berry from it. 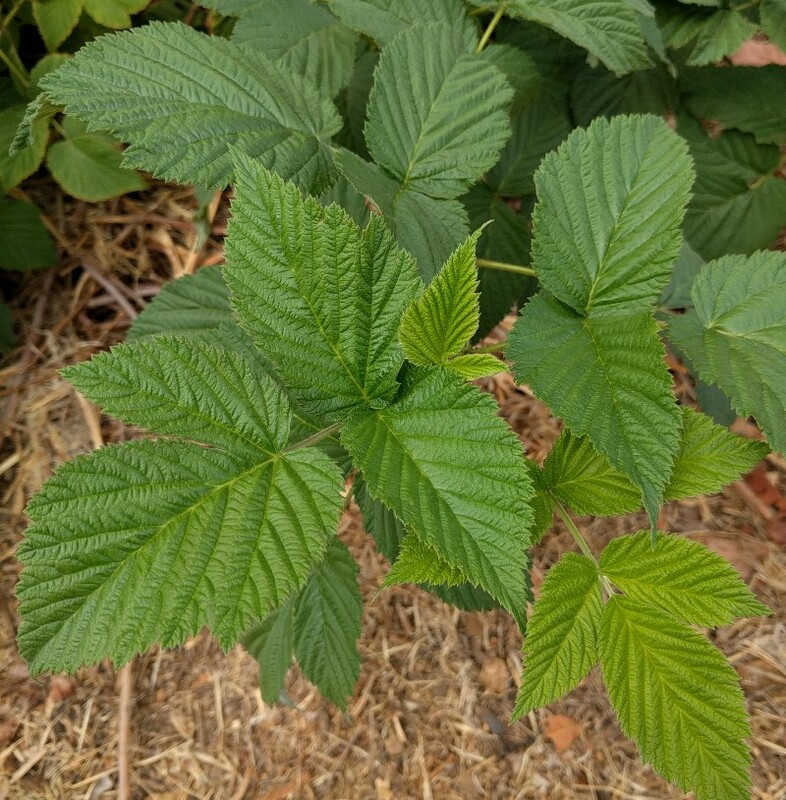 Would it be possible to get a cutting of your boysenberry along with some advice on a good place to plant it? My wife wished I was able to keep our golden raspberry going but it succumbed with the rest. Where are you located? I’m in Ramona now, where it’s too hot for any cane berries to do great in full sun. They like it better if they get some afternoon shade. Raspberries like more shade than blackberries or boysenberries, in my experience. But I used to grow these same boysenberries in my yard by Balboa Park in San Diego, where they were in a lot of shade, and they still produced acceptably. I have golden raspberries but find that red varieties are more productive in my yard; I don’t know why. Do you prune your boysenberries yearly? You can prune raspberries to the ground every year and still get berries the next summer, but if you do that to boysenberries you’ll never get any berries because they only produce berries on canes that are in their second summer of growth. I’m currently trying to expand my boysenberry patch, but I’ll see how many new plants I have in the winter. If I can spare one, I’d be happy to share. Remind me in late winter. Just wanted to make sure before I do something stupid, you’re supposed to cut back the seemingly dying raspberry canes around this time each year? I live in southern California and have two raspberry plants I planted last spring and got two decent crops (one in late spring/early summer and one that just ended in late September). The canes look like death and I was wondering if I prune it to the ground each year around this time. 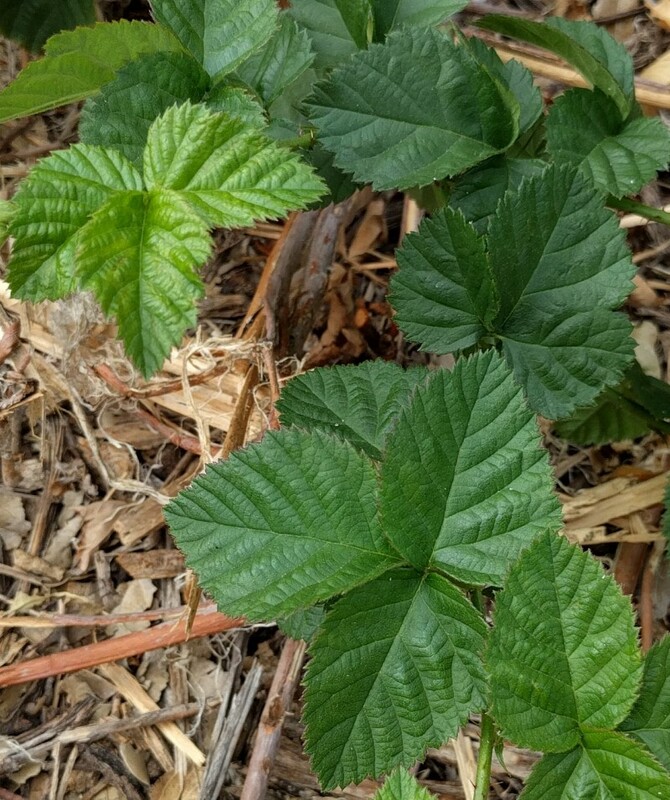 Raspberry varieties differ on how and when they produce berries. If yours look totally brown and dead now, then you might as well cut them to a few inches off the ground. They’ll regrow in the spring. But if some are still green (maybe even only the bottom halves of some canes are green), then you can leave those and they’ll probably produce a crop of berries in the spring/early summer. But if you’re unsure, it’s totally fine and safe to do no pruning at all. 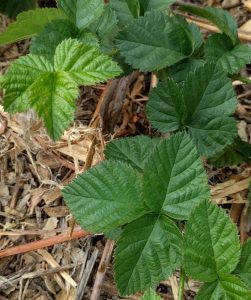 New shoots will eventually emerge from the base or somewhere on the cane and you’ll discover where the life is and what the habit of your raspberry variety is then. There’s no need to prune raspberries except to get dead canes out of your way. My boysenberry is small so I’ve never pruned it. Every now and then I need to chop the blackberry back as it goes out of control. The red and golden never grew too well so I never pruned them but then they died. I live near sdsu and am able to grow all sorts of stuff here so the raspberry challenge is a little frustrating. Blueberries have been a challenge as well. 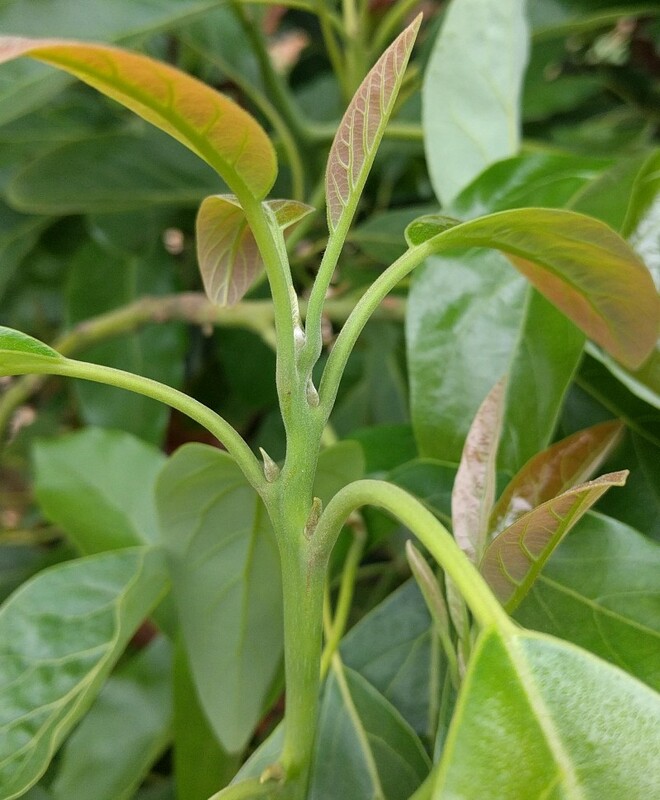 Unrelated, three of my four avocados are still showing damage and stress from the few super hot days this summer. I just finished pulling the last of the nectarines off and have a few peaches left on the tree so hopefully these next few days will ripen them. 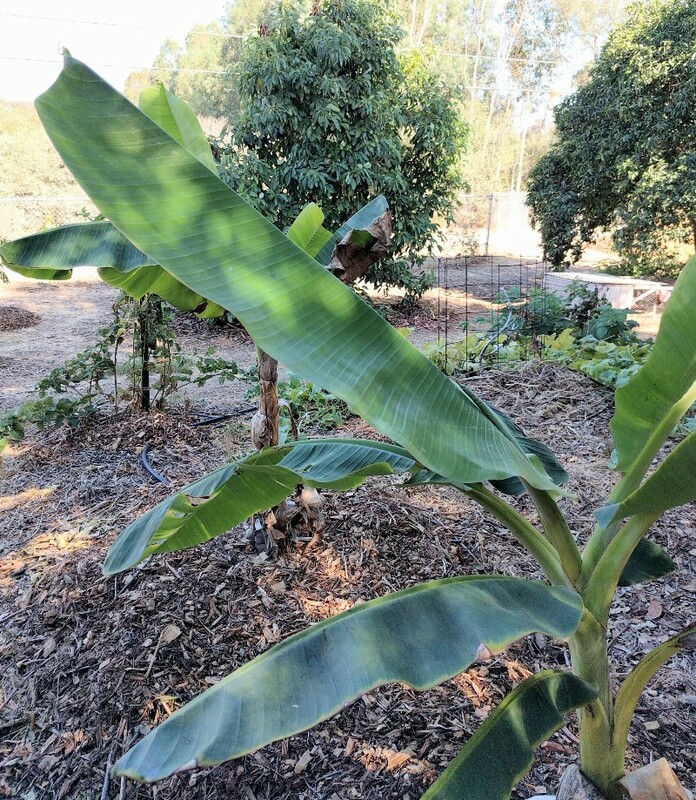 It also looks like I might be getting a second mango crop before it gets too cold…hopefully. What would your advice be on the best place in a yard to plant golden raspberries? I live near SDSU. Also, did you have any boysenberry leftovers? I’ve got lots of fruit trees here if you wanted to trade some cuttings. I’d put golden raspberries where they’ll get some afternoon shade. My golden raspberries did pretty well planted just east of my house — so they were shaded by the house in summer from about one o’clock onward. 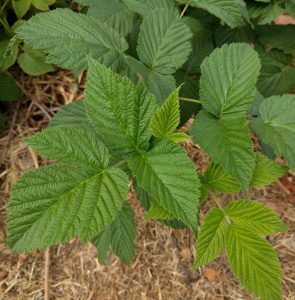 I have all my raspberries at the eastern edge of large trees now though and they seem to be doing even a little better, maybe because they continue to get dappled sun through the afternoon. I’m in Ramona, where the sun is a little more intense compared to near SDSU, so you could put yours in somewhat more sun. I’ve found that giving them ample water makes a big difference to their tolerance of our summers also. Sorry to let you down, but the boysenberry cane tips that I thought were in the soil and developing tip roots had pulled up without my noticing. I’ll try to bury a couple more now and see if I can get some rooting for you.